The adjustable Modular column formwork in use. Paschal-Werk G maier, a seventh-time exhibitor at Saudi Build, will present its wall, column and shaft formwork as well as the H20 beam in combination with the TG60 shoring system for high, horizontal concrete structures at the premier construction exhibition when it opens this month (October 17 to 20). “Given its long-standing presence in the regional construction market, Paschal is concentrating its exhibits on the primary applications in the Arab world,” says a spokesman for the leading German formwork specialist. At its 50-sq-m stand, Paschal will demonstrate the options for practical application, the system diversity and the compatibility of the systems and components for quick and easy use in reinforced concrete construction. In addition, its formwork experts will demonstrate to visitors the simple handling of the systems and also highlight some of the numerous projects completed. • Modular formwork: This universal formwork is preferred for use for the construction of foundations, walls, columns, beams, shafts and precast concrete components. As a result of its comprehensive range of elements, the Modular system can be used both as hand-set and large-size formwork. The modular design principle enables simple and quick handling, even by unskilled labour. • Modular column formwork: As a practical system expansion of this system, Paschal will be exhibiting the adjustable Modular column formwork. This system can be used to form both square and rectangular reinforced concrete columns with external dimensions from 20 to 50 cm in increments of 5 cm. Its simple windmill principle allows contractors to form a wide variety of different reinforced concrete columns from just a few individual panels. Depending on the availability and space constraints, the formwork systems can be moved completely by using a crane or can be dismantled into individual components and transported, assembled and dismantled manually. • Dismantling inside corner post: Frequently, massive steel reinforced concrete shafts that fulfil a double function in the form of lift shafts or supply shafts are necessary for the stiffening of reinforced concrete skeletons. For quick and precise execution, Paschal offers the dismantling inside corner post for the Modular formwork system. Each dismantling inside corner post has a hexagon nut on top of the inside corner post in order to open or close the corner posts. A size 36 spanner can be used for this or a DW 15 tie rod, which fits in the hexagon nut would also work, the spokesman explains. • Logo.3: This wall formwork system will be displayed in its steel and aluminium versions. Its formwork elements with profiled flat frames are robust and durable. The Logo.3 elements can be used both horizontally and vertically, and are connected by using a light wedge clamp that weighs only 1.8 kg, or by using a multi-clamp. The system’s comprehensive range of elements also includes multiple elements for corners, columns and stop ends. “Moreover, this formwork system is a winner when it comes to large-scale concrete constructions with minimum tie points of just 0.62 tie points per sq m,” he says. “The TTR’s pre-assembly is carried out in the factory. Its low proportion of tie points of just 0.28 to 0.55 tie points per sq m enable the shortest possible forming times,” he adds. • H20 beam with TG60: The TG60 shoring system is described as being ideal for constructing heavy-duty supports, shoring towers, stair towers and support scaffolds with great load-bearing properties. The system’s shoring towers can be assembled both erect or in a horizontal position. In order to transmit possible tensile forces, the individual frames are secured with hinged pins or bolts. As such, the system can be assembled on the ground and then subsequently lifted into position using a crane. 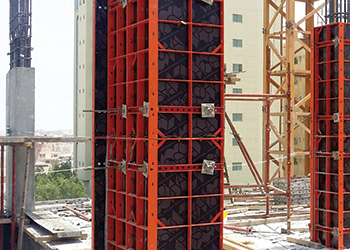 “At Saudi Build, we will show how easily and flexibly the TG60 shoring system can be combined with H20 beams, for example to safely ensure the load transfer of slab formwork,” says the spokesman. He says the adaptability of the H20 beam is achieved by simple overlapping. Therefore, whether the beam is functioning as main beam or cross beam is not of importance. The H20 beam comes in lengths of 245 to 600 cm. The permitted shear force of the 20-cm-high wooden beam is defined as Q=11.0 kN and the permitted bending moment as M=5.0 kNm. Alternatively, the 22.5-cm-high aluminium beam from the GASS programme can be used as main beam and as cross beam. The aluminium beams are available in lengths from 1.8 m to 7.2 m.
Paschal will be exhibiting at Stand 217, Hall 3, at Saudi Build.